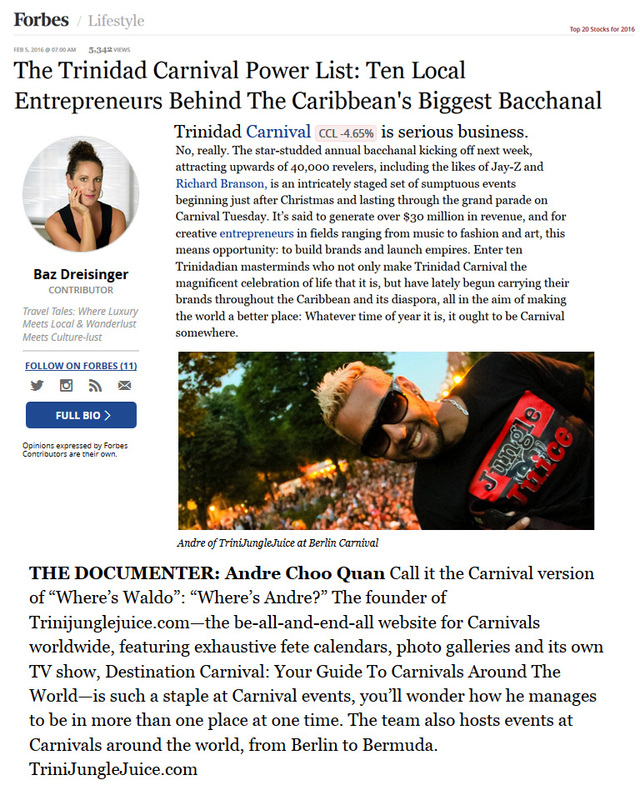 TriniJungleJuice.com is the 1st Caribbean entertainment website to take "YOU" Global, reaching Caribbean and International communities across the world. Our vision is to be the most sort after Caribbean resource online and offline for anything carnival. It is also important to us that we impact and serve the community in a very real way. There are four (4) main constituents that make this real and we serve. The folks who love this culture of energy and love that soca brings. The folks who travel around the world to surround themselves and bathe in this energy. The folks who travel all year long, going to unique destination, we want to give you access the most comprehensive, current and unbiased information for you to make informed decisions and plan the best experiences of your life. We will continue to service promoters and corporate companies who put resources into setting up an environment that gives the carnival community options. We will continue to augment your business with our expert ambassadors. We will continue to market, sell and partake in your efforts to spread this love and energy. Our job is to create ART while telling the story of carnival around the world. Our commitment is to be role models to help undiscovered and talented people rise up and be the best in their field. TJJ ambassadors are truly global from all walks of life, country and color without prejudice. We ultimately hope to inspire our ambassadors with guidance that stick with you forever and lead you to greater achievement. This is a new group of people that we are going to create in 2017. This group will comprise folks who invest a membership fee to TJJ. These members will have priority access or discounted rates to our events, our apparel and photography. TriniJungleJuice.com is a Caribbean flavored web site spanning all the cultures that comprise the Caribbean. The site's roots are buried deep within the sweet land of Calypso, Steelband and a most colourful Carnival in which an entire people express themselves... Trinidad & Tobago. From here, the site's many branches grow throughout the Caribbean archipelago blossoming in Cuban, Puerto Rican Latin Salsa, Merengue and Bachatta influences, as well as, Jamaica's Reggae and Dancehall. The site is unique. It is the first to pull the whole Caribbean together giving everyone a bird's eye view of the islands yet still feeling the plight of the new and upcoming artist of each community. Our passionate local correspondents allow us to penetrate at that level, something we are proud of, while our US based team use the leading edge technology to project this information globally. We dabbled with the internet since 1995 and in 2003 we	said we were going into the internet as a business and they laughed at us. We know them as 'Nay Sayers'. These are the negative thinkers, the pessimists & the non-believers. All too often, this limiting mindset influences us in our thoughts, our hopes & our beliefs. Why should we conform to the norm of a many few?